Would deduction of child maintenance from joint accounts open a can of worms? - The DWP's consultation on plans to make deduction orders to recover child maintenance arrears from joint bank accounts held by a non-resident parent. Doesn’t it strike anyone as strange that the judiciary should be provided with guidance on needs? 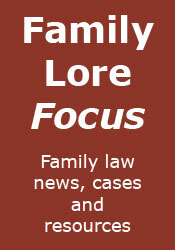 - The Family Justice Council's Guidance on “Financial Needs” on Divorce. Father must be served with statutory will papers - The Court of Protection case Re D.
MCJ v MAJ: financial remedy principles in action - Roberts J's judgment in MCJ v MAJ (Financial Provision: Treatment of Non-Matrimonial Property). Calculating income under the current child support scheme - The case IW v Secretary of State for Work and Pensions and DW (CSM) (Child support : calculation of income). Are child contact centres to become a thing of the past? - Some thoughts following the news that another centre is to close, as a result of the legal aid cuts. Denial of contact does not breach Russian father’s right to family life - The ECHR case Krapivin v Russia.